Architecture mixed with electronics mixed with animation — we think nothing of mixing these elements now. In 1958, as PoÃƒÆ’Ã‚Â¨me Electronique was unleashed on the Brussels World’s Fair, it was still experimental. 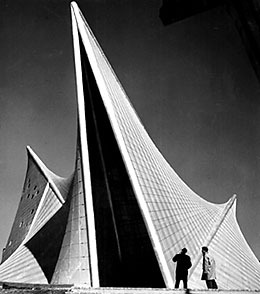 The animation/installation/composition was the collaborative creation of legendary modernist architect Le Corbusier, his assistant Iannis Xenakis, who would later come to be known as a ground-breaking experimental composer, and composer Edgard VarÃƒÆ’Ã‚Â¨se. VarÃƒÆ’Ã‚Â¨se is certainly one of us: part of the reason he went into a compositional drought for many years was he was frustrated by the limitations of acoustic sound, and longed for the electronic labs we have today. The results are, well, totally bizarre, even now. (Or, perhaps, especially now.) There’s a certain freshness, though, to the oddness of the work. I wonder what the ultimate PoÃƒÆ’Ã‚Â¨me of the 21st Century could look like. I don’t think I’ve seen it yet. Via Rhizome, via Screenhead — thanks to Marisa Olson, as I’ve been hoping this would crop up online for a long time! More info on the work, with links, at the Electronic Music Foundation. Updated: The old YouTube link wasn’t working; here’s a new one. If that doesn’t work, try a YouTube search for Poeme Electronique.